Not long after becoming engaged Jane and I thought it would be good to invite our families together for a meal to get to know each other…and that gathering happened last weekend. Jane is the youngest of four sisters, I am the eldest of four brothers and all our siblings are married, so it was no small feat to bring together 18 adults and 13 children. My mum and dad offered to host the lunch at their place. They have a big backyard with plenty of room for running and playing (for the children that is). My parents were providing the lunch and Jane’s parents were supplying the dessert. Dad, mum and I thought we would opt for a Middle Eastern BBQ menu with lamb and chicken skewers, tabouli salad (homemade, not like that so called ‘tabouli’ you buy in the shops), hummus dip and plenty of Lebanese bread. I even bought a coal BBQ to add to the authenticity! As I have mentioned previously my dad is Syrian and a great cook so he prepared and marinated the meat and spent half a day chopping up enough parsley and tomato for 21 hungry people. I had met all of Jane’s family before so was not nervous about how the day would work out. I was speaking to mum after the event and although she was not nervous either, she was keen for a good day and hopeful that our families would get on well together as for the rest of their lives they would be meeting up on various occasions. I am not a historian but from the little I know the families-coming-together aspect was somewhat bigger in the past than it is now. The great family dynasties of antiquity were not going to wait to meet the family of their child’s fiancé at a BBQ and hope for the best. I think many of them would shortcut the process and chose the right family first then find the fiancé accordingly. Thankfully neither our families are important enough to have necessitated such a process. For me this is one of the most interesting aspects of marriage though; two families, which in general circumstances would never even know each other, are tied together for life. Jane and I freely choose one another and will vow to commit to one another but as an extension of our personal union there are also two families becoming one. 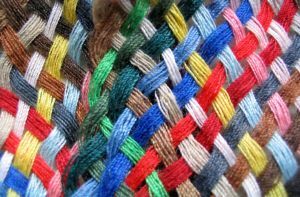 I was thinking about it a bit like a tapestry, each marriage that occurs is like two different threads being crossed together and all these crossed threads create the wonderful and colorful fabric of marriage and family. Without marriages and the union of families the fabric of culture and society would simply fall apart. Our marriage is going to create a whole new set of uncles, aunties and in-laws. It really is amazing how far reaching our decision to marry is; more than just a personal and private choice, Jane and I are continuing the human story. It is also the beauty of the woman taking a new family name. I know some people take it as a discriminatory practice but in truth it is this unique statement that two people have completely become one. The woman enters into the care and the love of the man who is called to be at her service in a complete and self-sacrificing way. I always remember hearing a priest say that while the wife is called in some sense to submit herself to her husband, she should only marry a man who has already submitted himself to Jesus Christ. For if the man is not under the mission of the Lord, in what way will be treat and lead his wife and family? So when Jane becomes Mrs Toutounji I know that she is only accepting that because I would have vowed to spend my life as Christ to her; and from that basis can our new family unit be formed. And so our two families met for lunch. My dad welcomed them all with a few words and then we continued a ritual that has been going since the dawn of civilisation, we sat down and shared a meal together. And in the sharing of that meal we began, perhaps more officially, the union of two families. Posted in Uncategorized and tagged enga, family, marriage, siblings. Bookmark the permalink. Have you ever heard of Christopher West or Jason Evert? It was one of them who first explained that a wife’s “submitting” to her husband doesn’t mean being a doormat and letting him control her. As you wrote, a good husband should be under the mission of (sub-miss-ive to) Christ. Therefore, a wife who is under the mission of her husband is really submitting to Christ. There’s such beauty in the truth. First off, public congratulations to you both. Have not met Jane yet, but sounds like you to are meant for each other. Second, thank you both for being brave enough to make public a lot that most people only keep amongst friends. We know you Bernard were seeking a way to express your faith and this certainly is one great way to do so. All too often Catholics are not even prepared to talk about their religion much less evangelise. We hope the secular media is as quick to pick up this story as they were to pick up things recently discussed on Four Corners. Aside from getting it broadcast to the wider world, for those not prepared to comment but at least read your story and about your journey, we hope that they realise that that are other ways to go about “becoming partners” than just sharing the same address! Lots more can be said but we’ll leave that for a later time. Freedom doesn’t have to be evidenced in the whole group for it to exist in the hearts of two. But I do like the part of the Nuptial Mass in which the congregation commits to supporting the couple. Our family is the body of Christ and we need to be free to commit to this. However, I loved your story. Thanks for witnessing to the possible!